Overwatch officially begins on Tuesday, May 24, but depending on where you are in the world, you might get to start playing a little bit sooner. Well, it's still the same amount of time away for everybody, since the game is launching at 12 am BST everywhere, but certain people will get to start playing earlier on the clock because of time zones and the speed of light and quantum and... You know what? Just look at the chart. Overwatch is currently available for pre-download on Xbox One and should hit PC today. No word on when PS4 will start dishing out the downloads, though generally these things happen over the weekend, probably by Sunday at the latest. You'll even be able to buy the game at retail starting on Monday, May 23, so you won't have to wait to play until midnight local time just because you want a physical copy. 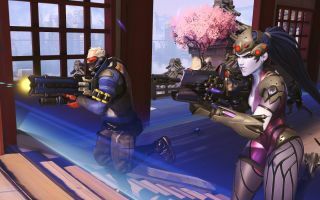 Blizzard also published a thorough infographic running down Overwatch's popular open beta earlier this month. You know more than 326 million Bastion characters got blown up in the space of a few days? Almost like everybody's tired of him mowing down enemies by the dozen and getting Play of the Game with minimal effort. Not like I ever did that. Nosiree.